Friendly and personable. Entertaining and not too pushy. Mr. Crawford was very cheerful and helpful in servicing myself. Very professional and down to earth. We are more than happy to read that you were pleased with our sales professional, Byron Crawford. If we can do anything else for you, please give us a call! I APPRECIATE THE GREAT HELP THAT WORLD HYUNDAI GAVE ME! MY SALESPERSON TROY IVORY WENT ABOVE AND BEYOND THE CALL OF DUTY. I was very pleased with the level of service i recieved from Angie Mcferren and her whole team. I valued all the effort they gave in getting me the car of my choice rather then what was the best fit. I would and will refer friends and family to shop with World Hyundai. The service was wonderful. Iisa was very helpful . I am trully thankful for Lisa and Mike they are team players.Mike was very funny he really broke the ice . The staff was excellent and very friendly. I have nice new car that I am very pleased with. The atmosphere was very very pleasant. I am so happy that I chose World Hyundai. I am going to recommend everyone I know that wants to buy a car!! Thanks Tom, David, and Lori and HAPPY BIRTHDAY TO ME!! lES DID A GREAT JOB IN EXPLAINING THINGS AND GAVE BE GREAT SERVICE. The service was excellent. My seller is one person you can depend on when the job needs to get done. Me and my husband were very satisfied. we like to thank Chris for putting us in a new car thanks. Thank you for your Hyundai car review! Chris is a great guy - I'm glad he was able to take car of all your needs. Making you a happy Hyundai client is what it is all about! 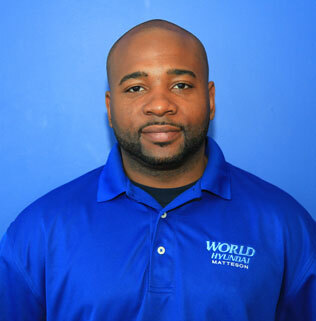 DANNY JONES WAS VERY HELPFUL IN MAKING THE PURCHASE- HE WAS VERY PATIENT AND I LIKED THE SERVISE GIVEN BY HIM. Thank you for coming from Gary to get your used car loan from us. We really enjoy helping Gary car loan customers! Mark did a wonderful job helping me, I came in not wanting the car that I was in and he was able to get me the car that I wanted at the right price. He was very professional and kept it real he did not give my false hope like most car dealers do. I would send people looking for a car to him anytime. I had a great experience at World Hyundai, got the car I wanted and saved plenty of money. Great Deal. a good experience.... overall. He was very good at explaining the cars and the options.